Being a mom, wife, and college student - I'm often looking for ways to relax and enjoy whatever few free minutes I have to myself. I've grown accustomed over the past year or so to using this short "free time" to use a mask on my face to help make up for the negligence I'm usually giving my skin due to a busy schedule. Wash-off masks [made from clay, mud, or cream] are great and all, but I've found that my skin seems to get much more positive results from sheet masks. If you're unfamiliar with sheet masks, that's ok! I'll do my best to explain them briefly in this post for you. Sheet masks are a sheet - usually made of cotton, pulp, fabric, or bio-cellulose (gel) - and cut to the generic shape of a face, complete with holes for eyes, nose and mouth. Some masks even come in two pieces for better fit. Sheet masks are unlike your traditional wash-off masks in that they are not meant to deep clean your face, and you do not wash them off in any way. The sheet is soaked with essence (similar to a serum) and when you apply the sheet to your face, your skin has a chance to absorb the essence for a prolonged period of time (usually 10-30 minutes). Sheet masks are best for hydrating the skin, but they come in so many varieties, you really can find one to fit almost any type of skin condition or need. They range from dirt cheap (I've found them as low as 50 cents a piece online with decent ingredients) to top of the line (SK-II Facial Treatment Masks retail for over $15 a piece). I've reviewed sheet masks on my Instagram, but I'm bringing them here today to tell you about a sheet mask subscription service that I think any mom (or dad, or student - anyone really...) would enjoy: MaskGenie! MaskGenie is a monthly subscription that sends out a bag of either 5 masks for $12 or 10 masks for $22 - these prices include shipping, and MaskGenie ships worldwide! What I love about MaskGenie is that it gives you the opportunity to try new sheet masks that you may not have heard about before and some from different brands than what is most readily available to everyone. MaskGenie recently sent me a limited edition pouch to try, and share my results with you all. This pouch was made up with a limited supply of masks and was available for purchase separately from the monthly subscription, and was sold for $34 inclusive of shipping. Below I'm going to share a brief overview of the pouch with you, and later on I will share a new post with my thoughts on the masks after I've used them all. The "10 Days in the Wild" pouch contains 10 different sheet masks, all of a different animal faces, and a few different brands as well! The first three pictured are from Berrisom. There is a monkey face mask with snail as a main ingredient (one of my favorites because it is repairing and really helps my acne - great for any skin type though to be honest! ), a cat mask with collagen, and a raccoon mask with placenta and adenosine. The next two are from Royal Skin; a fox mask and a sheep mask. These are basic hydrating masks with no advertising of special ingredients on the packaging like the first three. 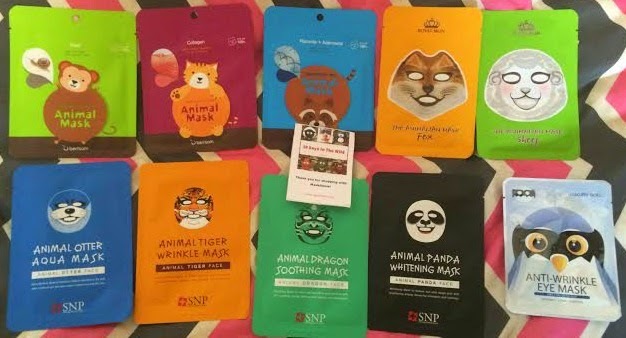 The following four masks are all from SNP (or Shining Nature Purity); an otter aqua mask, a tiger wrinkle mask, a dragon soothing mask, and a panda whitening mask. Again, no special ingredients listed but instead a key-word hinting at what this mask will do for your skin. The final mask is an anti-wrinkle eye mask that may make you look like a penguin from Luxury Soo. Check back soon for a second blog post with my reviews of each mask included in MaskGenies's "10 Days in the Wild" pouch! 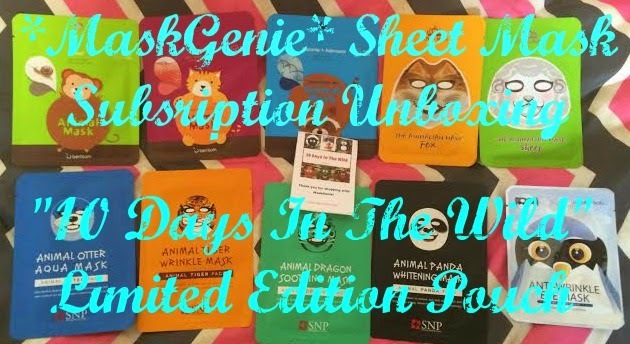 Make sure to check out MaskGenie online and their subscription service for a great way to try new sheet masks. I have used many masks in my life but never even heard of sheet masks! They have me intrigued. I can't wait to hear how they work on you!! U am almost tempted to get 1 or 2 of them now but have to go look to see if they sell them singly. I just started using mask within the last year and I love them! They really help my skin.